One thing all good parents have in common is that they worry about the safety of their babies and children, and no time is more worrisome for parents than those night time hours away from their child. Fears were eased somewhat when the first baby monitors were created but they were cumbersome and plagued with bugs and false alarms. Today, top baby monitors are very complex and there are many different types to consider. There are several important considerations to make when purchasing one. The Angelcare line of monitors offers the peace of mind that parents need along with the safety that infants and children need. From a sleek design to a good operating range, the Angelcare baby monitor is one of the most popular models on the market today. Batteries: 4 AAA batteries required. Like with any electronic device, there are pros and cons and the Angelcare sound monitor and motion monitor is no exception. The important thing to remember is that both pros and cons must be carefully weighed and considered in order to see what ones mean the most and have the biggest impact on your unique situation. It helps to consider the main components of the monitoring system and look at the pros and cons of each one. A baby video monitor’s purpose is for parents to know that their child is safe and to alert parents of any problems during their baby’s sleep or to alert them once the child is awake. Some monitors, such as this one, rely on audio monitoring that picks up on the sounds in the room and the sounds that your child makes as he or she is asleep. 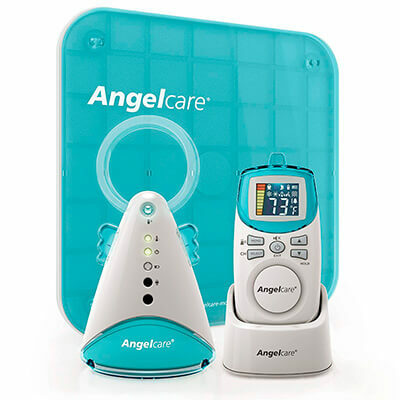 The Angelcare AC401 system monitors sounds and will notify you if there is a lack of sounds- even the faint sound of your baby breathing- and will also allow you to hear the sounds coming from the crib or bassinet. The pros of this type of system is that you can hear everything going on, just as if you were in the room or standing right outside the door. The audio monitoring allows you to still be comfortable sleeping in bed and hear when your child wakes up or if they cry. The system also helps ease parent’s fears by letting them hear the sounds of their baby breathing. The Angelcare baby monitor offers crisp and clear audio and helps you rest easy when you cannot be right by your baby’s side. There is no drawback to the audio system of the Angelcare sound monitor as it offers clear and crisp audio all night long. One of the most unique factors of the Angelcare AC401 monitor is that it relies mostly on movement and motion detection. Sensitive reception pads are placed under the sheet of the crib that connect to the monitor. These pads pick up any movement, whether it is the child rolling over, playing, or breathing as they sleep. The sensors will send out an alert to the monitor if no movement is detected. This can be a huge comfort for new parents as one of the biggest concerns for infants is Sudden Infant Death Syndrome, which usually strikes at night or when the child is asleep. The Angelcare AC401 baby monitor will alert parents if their child stops moving or breathing in the middle of the night. The one drawback to the movement monitoring design is that the pads are very sensitive but also very specific on how they must be used and set up. The main complaint parents have about the system is that it takes a little bit of trial and error to get the pads positioned and hooked up correct to avoid false alarms and accurate readings. However, once that sweet spot is discovered, the Angelcare baby monitor works like a charm more times than not. “After the first night of getting no sleep and hovering over our son’s crib to make sure he was still breathing, we ordered the Angelcare Deluxe Plus Monitor… I HIGHLY recommend this unit, particularly since it has two sensor pads… It took about a week to have a false alarm, which was caused by our son turning sideways in the crib and laying in the space between the two sensors. I made a quick adjustment and have not had a false alarm since.” K.M. Parents are raving about the Angelcare AC401 baby monitoring system and it is time you discover what everyone is talking about. There is so much parents have to cope with day in and day out- fear of night time problems should not be one of them! The Angelcare AC401 line of monitors offers the peace of mind that parents need along with the safety that infants and children need. From a sleek design to a good operating range, the Angelcare sound monitor and motion detector is one of the most popular models on the market today!